Click for your inks at Clickinks, online at Clickinks.com. 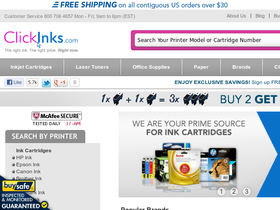 At ClickInks.com, you can save up to 86% on top brand inks and toner. With 1 million items in stock, they offer 100% Satisfaction Guaranteed on all our printer ink cartridges. Shop for top brands including Epson, Kodak, Lexmark, HP, Brother, Dell, Samsung, Canon, and more. Clickinks also offers more than ink with a wide range of paper supplies and office supplies. Save on your next Clickinks purchase by stopping by RetailSteal.com for all the latest and greatest Clickinks discounts, Clickinks coupon codes, and Clickinks promotions. Clickinks offers free shipping on orders of $30 or more to the contiguous United States. All returned cartridges must be at least seventy percent (70%) filled (which we feel is sufficient to enable a fair test of the quality of the product). See site for more refund details. Shop at Clickinks and enjoy $30 savings on orders $300+. Click here for code. Shop at Clickinks and enjoy $20 savings on orders $200+. Click here for code. Use this coupon code on ClickInks and save $10 on your entire order. Must spend $100+ to qualify. Use our coupon code online at ClickInks today to save $5 on your purchase of $50 or more. Use this exclusive RetailSteal coupon code at Clickinks and save 10% off your purchase. Exclusions may apply. With the coupon code, save 10% on inks and toners at Clickinks.com. Click link to shop and save. Save 10% on office supplies with the coupon code for a limited time at Clickinks. Click link now. Sign up with Clickinks and they'll give you a 5% discount if you're buying for schools, corporations, or the military. Shop online at Clickinks.com and enjoy free shipping on your order of $30 or more. Act now and take advantage of this buy 2, get 1 free promotion from Clickinks.com. Enjoy buy 2 get 1 free savings on Kodak Ink Super Saver packs at ClickInks.com. Click link to shop. At Clickinks, buy two HP, Lexmark, or Dell Ink Cartridges and get one free. Click link for savings. Save up to 86% on HP products only when you shop at ClickInks. Check out Clickinks.com and enjoy up to 85% off ink and toner supplies including top brands like HP, Dell, Lexmark, Epson, Canon, Kodak, and more. Save 5% on your order from ClickInks.com when you enter this promo code at checkout! Save 20% on your purchase from Clickinks when you use this code at checkout today. Enjoy a 15% discount on ink from ClickInks online when you enter our coupon code online. Don't miss out on this discount.